Bringing together some of the world’s best PRO-AM riders! As July comes to a close and Floridian temperatures continue to soar, P1 AquaX heads to cooler climates for the start of the North-Eastern Series. 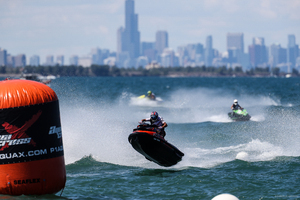 Taking place on August 11th & 12th , Whiting, Indiana will be the first round of the series with the race itself being located on the beautiful southern shore of Lake Michigan. 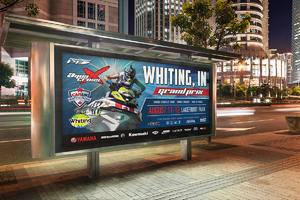 This will be P1’s third year of partnering with the City of Whiting to put the event on at Whiting Lakefront Park. 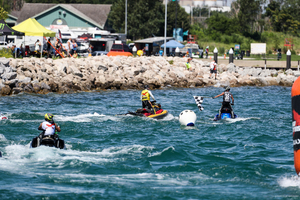 Mark Harbin, Director of Special Events for the City of Whiting said, “Mayor Stahura and the City of Whiting are excited to be hosting the P1 AquaX event for a third year. This weekend-long event provides us with the opportunity to showcase our lakefront and all that it has to offer for residents and visitors alike. With its global reach and extensive broadcast coverage, P1 AquaX is perfectly positioned to promote our great city”. This event will bring together some of the world’s best PRO-AM riders providing an opportunity for both Pro riders and Amateur riders to race against each other on the same course (the PRO riders just need to adhere to amateur rules). 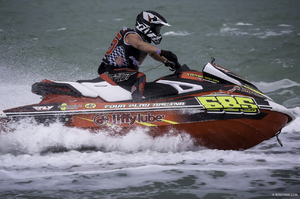 Spectators can expect two full days of on-water action from 10-3pm, and can also walk through the race pits to see the different craft – Yamaha Waverunners, Sea-doos and Kawasaki Jet Skis. 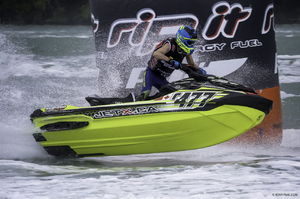 There will be some familiar faces to be seen out on the water, Canadian Jay Edworthy will be hoping to make it a hat-trick as he endeavors to win for the third year in a row at this popular venue. Last year he battled it out alongside team mate Dave Davidson, also from Canada and part of the Jet X team. Dave is one to watch in 2018 as he has soared to the top of the leaderboard for the 2018 Amateur national series and rumor has it that if he keeps going as well as he is, he might well move into the PROs in 2019. He currently sits in first place for the USA National series. The event also marks the return of a couple of racers hoping to make a dramatic come-back. Number 585, PRO-rider Victor Nolan, will return after taking some time out after welcoming a new baby to the family. Visit St. Pete Rider, Jason Lester, is returning to racing for the first time after recovering from an ankle injury he sustained in a collision earlier this year in the Florida series. Despite the injury, he has still attended every P1 race in the Florida series supporting fellow team mates, Christian Daley and Tyler Hill, notably lending his ski to ensure they did not lose valuable points. 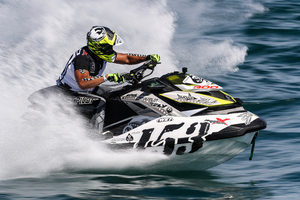 There are also several brand-new racers to line-up - those who have never raced their jet ski competitively before. One of the unique attractions of the P1 AquaX series is it’s accessibility to new riders looking to try their hand at racing for the first time. 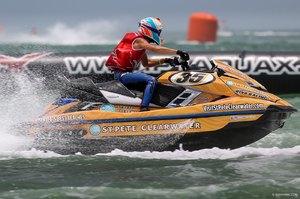 Anyone interested in jet ski racing can sign up for P1 Whiting as a stand-alone P1 AquaX event with no prior racing experience needed. We provide the platform and insurance, all you have to do is sign up. Event entry fees are $150 and required IJSBA annual membership is $60. All necessary training will provided on the event weekend, you just need to ensure you have checked you have all the safety equipment listed on the P1 AquaX website (e.g. helmet and back protector). For more information visit www.P1AquaX.com/FAQ. Entries will close on Wednesday August 8th. The event is free to watch and family friendly and there is live commentary to keep you updated on what is happening on the water.